Recent natural disasters, along with public and regulatory pressures, are forcing telecommunications providers to focus more closely on providing reliable, extended emergency backup power, especially for outside plant assets and inside central offices and data centers. As a result, new battery technologies and power architectures have been employed. Although each technology has some advantages, the quest for continued safety, savings and reliability continues to drive providers to seek alternatives. Innovative technologies, new forms of energy storage, and advances in power conversion and architecture offer today’s telecommunications industry new solutions to the dual challenges of balancing initial investment with long-term operating costs, while delivering high reliability in a small footprint. These solutions, such as lithium ion batteries, hybrid fuel cell systems and distributed power architecture, are quickly becoming a tangible reality for cost-conscious owners/operators, providing flexibility, efficiencies and performance for central office, data center and wireless base station installations. State Regulations: Telecommunications providers must meet more demanding requirements to ensure reliable coverage to customers in those areas prone to natural disasters, such as hurricanes, floods and earthquakes. Population and Products: The customer base for wireless products continues to expand, as the population and the number of products and services continue to grow. Corporate Strategies: In today’s highly competitive market, telecommunications providers are striving to stay ahead of the curve by expanding their offerings to include the latest technologies. These changes — such as adding 4G capabilities, while maintaining the existing 3G platform — require more space for communications equipment, wiring and backup. For emergency backup power in telecom stationary battery applications, flooded batteries were the technology of choice because of their recognized reliability. However, as the network expanded outside of the CO, maintenance costs, susceptibility to environmental conditions and poor energy density left the market looking for alternative power sources. Fewer restrictions: No spill containment is required and there are no HAZMAT transportation restrictions. Easier installation: There is less cost involved in installation. Approximately 25% less space and weight: These are key factors as the backup system is contained in a space-restricted field cabinet or hut. Less out gassing: Ventilation is required to avoid potentially hazardous hydrogen gas buildup. Less maintenance: While not maintenance free, the VRLA battery does not require watering. On the other hand, high temperatures can have an increased negative impact on the reliability and longevity of VRLA batteries. Furthermore, unsupervised OSP applications using VRLA batteries can be more prone to thermal runaway. The life span of VRLA batteries is also an issue. A properly maintained flooded battery in a controlled environment can have a lifespan of up to 20 years (10 to 12 years in UPS high-rate applications) compared to a VRLA battery which has a life span of 2 to 8 years in the OSP, depending on climate and environment (and just 3 to 5 years in UPS). New front-terminal 16V UPS batteries are more space-efficient and easier to maintain than traditional 12V UPS batteries. They use proven VRLA technology, are conducive to incorporating monitoring systems, and scale easily to larger capacity UPS systems with one-fourth fewer parallel battery strings. Front-terminal VRLA batteries fit easily within many existing cabinet designs, with no wasted space. There are no sliding trays and no complicated wiring. 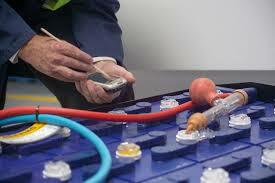 Maintaining front-terminal batteries is also safer because the technician does not have to reach over a live battery. Like the new VRLA batteries, next-generation TPPL batteries continue to feature the traditional telecom front-mounted terminals for easy access. They combine the tried-and-true lead acid technology with a power-dense design for added space savings. They also have lower corrosion rates, lower float currents (lower than more common thick plate lead calcium batteries), and provide better protection against onerous environmental conditions, which combine to improve shelf life by 3 times VRLA batteries. OSP/wireless base station installations also lend themselves to the use of temperature tolerant and energy-dense lithium ion (Li-ion) batteries. Li-ion batteries are ideally suited for use in OSP/wireless base stations, as they occupy one-half the space and are one-quarter of the weight of VRLA batteries. This energy-dense design enables users to quickly expand their energy storage in very small footprint, thereby minimizing construction, distribution, and permitting costs. Today’s Central Offices2 (CO) have an opportunity to significantly improve reliability, while cutting costs and shrinking the overall plant footprint by converting from the traditional centralized DC power plant structure to a distributed DC power architecture. This change is made possible through technology advances in the power system. The traditional centralized -48V DC telecommunications CO basic power system consists of a rectifier plant, a DC distribution system that provides branch load protection (i.e., circuit breakers, fuses, contactors and sensors), a plant controller (usually a microprocessor) and monitoring system, and an energy reserve system consisting of indoor electro-chemical batteries — usually flooded batteries or VRLA, coupled with an engine-alternator or fuel cell. Heat Exhaust: All of the elements of the system, such as the rectifier, lose some incremental amount of power. As power is lost, such as via the copper cabling, it manifests itself as heat. This needs to be addressed through a ventilation system. Distribution Cable Voltage Drop: The copper cabling used to carry DC power from the source to the equipment naturally experiences conduction loss, resulting in added heat. Even more importantly, for low voltage systems (such as nominal 24 and 48 VDC) with tight operating windows, large voltage drops can severely limit the available battery backup time. Larger diameter cables can be used to overcome the loss. Practical limits apply, however, as large cables can be difficult to route and terminate. Too many large cables also can cause cable congestion in an already space-restricted cabinet. Acid Leakage: Acid leakage from lead acid batteries can cause corrosion and damage sensitive circuits. Size and Weight: Energy density is a serious concern, especially in older plants that still may have ferroresonant rectifiers. Ferroresonant rectifiers are very reliable, but they occupy precious real estate — with the largest installations weighing as much as 40,000 pounds and occupying up to 275 feet. Furthermore, with a conversion efficiency of just 80 to 90 percent, ferroresonant rectifiers may be losing as much as 20 percent of their power upon converting from AC to DC. Maintenance: Flooded and VRLA batteries require inspection, maintenance and fluid adjustment throughout their operational life. Newer distributed DC power architecture systems use advances in power supply efficiencies and power densities to decrease thermal loss in a circuit and increase overall performance, addressing these concerns. The distributed power architecture replaces large central power plants, multiple copper buses and large cable runs with lower capacity individual power plants serving dedicated equipment. The power system then provides energy to a wide array of communications equipment, each operating on its respective voltages. 1. Lower Initial Cost: The distributed architecture system completely eliminates the primary DC distribution system. Significant Space Savings: The new architecture eliminates the need for a separate power room. Greater Efficiency: New generation switch mode rectifiers provide a high conversion efficiency up to 97 percent and an energy density that is 20 times that of older ferroresonant rectifiers. Combined with high efficiency front terminal VRLA or Li-ion batteries and shorter runs of smaller cabling, the distributed architecture system reduces waste heat and significantly boosts overall efficiency. Easy Expansion: The distributed architecture makes adding new communications equipment easy. Power can be added right at the point of the new equipment without long, bulky cable runs. Improved Reliability: By eliminating the large, central power plant, power system reliability is now shared among multiple points within the system. Therefore, a failure in the distributed power system is now confined to only one small area rather than the entire central power plant. Critical Redundancy: By significantly reducing DC power plant costs, it is now possible to supply full redundant power to the most critical communications equipment. Almost all equipment is dual fed (redundant A and B power feeds). In centralized DC architectures though, it was rare to have true A and B power plants with distinct feeds due to the high costs of a centralized DC plant. Distributed power plants make true A and B power plant redundancy (and, thus, greater reliability) much more economical than having 2 centralized plants. Supply Flexibility: When using a centralized power plant architecture, telecommunications providers often had no choice but to purchase the same or like-for-like system components from the same manufacturer (i.e., rectifiers, primary distribution units and secondary systems). By decentralizing the architecture, providers now have the freedom to purchase components from multiple suppliers. Data centers consume a huge amount of our nation’s power at up to 3 percent3 of all electricity. Much of this is used for data center cooling. Unlike COs, data centers traditionally operate on high voltage AC power. A UPS, usually using VRLA batteries for backup, stores incoming power at nominal 480 volts. The voltages inside a UPS and available stored energy can result in severe arc flashes and blasts, causing worker burns and injuries. AC power is converted at least twice in the UPS (with resultant efficiency and heat losses), and then runs from the UPS through a step-down transformer out to the equipment areas. At the equipment level, a power supply changes the AC voltage to DC, and then individual small DC-DC converters in the equipment convert the voltages to the digital logic levels used by the cards. Like COs, data centers are under tremendous pressure to increase efficiencies and drive down costs. One way to increase data center efficiency in telecommunications networks is to convert from an AC power UPS to a DC-to-DC system. Improved Worker Safety: A distributed DC power system would reduce voltage from 480V to a more manageable and safer -48V DC. Greater Efficiency: A DC system would reduce the number of power conversions from an average of 5 to as few as 2. This overall reduction in wasted heat not only reduces the direct cost of electricity, but also reduces ventilation and cooling. Smaller Footprint/Easy Expansion: As with a CO, the distributed layout paired with new next generation front terminal VRLA batteries or energy-dense Li-ion batteries would free up floor space, allowing more room for data center equipment and expansions. Today’s telecommunications industry is on the cusp of significant change. New high efficiency rectifiers, next generation batteries and cutting edge technologies are enabling the industry to embrace major infrastructure changes, such as distributed power architecture. The new innovations deliver increased reliability and efficiencies, enabling telecommunications providers to afford and support these systems, despite higher initial installment costs. While the existing tried-and-true technologies will be with us for a long time, the new systems are gradually finding their way into key applications where benefits are most acutely felt, such as new installations where change is easily implemented, large facilities where savings are felt exponentially and critical locations where reliability and longevity are paramount.